In my previous two pieces on Wallis'sThe Death of Chatterton I argued that the picture has a much more radical politcal edge than is often supposed. Wallis's beliefs- Republican, atheistic and pacifist- differentiated him from much of mainstream Preraphaelitism although they do link him strongly with the critic William Michael Rossetti who held similar views. His radicalism can be traced back to an intellectual tradition linked to the British supporters of the French Revolution and to the Shelley circle in particular. In the context of mid Victorian England these were views that could not be advertised too openly, not least because atheistic revolutionary France was then still regarded as Britain’s chief foreign threat. So my case had to be based largely on circumstantial evidence drawn from Wallis’s choice of radical subjects, drawn from sixteenth and seventeenth century British history. However, in his comment on the painting in The Artist as Original Genius William Pressly has found a smoking gun, as it were , within the picture itself.In the torn up manuscripts scattered besides Chatterton's bed there is a jumble of of individual letters which read' MIDDLE …. XOR CHRONICLE'. From them he deduces the banner newspaper headline The Middlesex Journal or Chronicles of Liberty with a logotype of a seated Britannia with a liberty cap on her staffs. Beneath it is the year 1770 (Pressly 148). The reference is clearly to Chatterton’s activities as a radical political journalist in the last year of his life rather than to his work as a poet. Specifically it refers to Chatterton's support of the radical politician John Wilkes. In 1767 Wilkes had been elected to Middlesex having previously been expelled from the House of Commons for blasphemous libel and for attacking the monarchy. Under the pen name Junius Chatterton had attacked the church-state alliance and in particular the Bishop and Dean of Bristol, from where he originated, for supporting the monarchy against Wilkes. The subject matter of Chatterton, therefore, brings it close to Wallis's two other 1856 RA submissions which featured the anti-monarchical figures of Henry Marten and Andrew Marvell. It may also justify a new interpretation of the skyline seen through the open window featuring St Pauls. For Wallis , as for Chatterton himself, St Pauls would have symbolised a Tory church-state establishment which would have been implacably hostile to the revolutionary artist. Chatterton then appears as a Promethean figure cast down by hostile Gods". I would suggest, therefore, that the political meaning of the picture was wrapped up in a code which relatively few viewers at the time would have been able to break. It is likely that William Michael Rossetti, who shared Wallis's beliefs, would be have been one. Another would have been the radical historian and journalist (and Dickens's biographer) John Forster. Forster's Lives of Eminent British Statesmen of the Commonwealth (1836-39) took a strong pro-Parliamentarian and anti-Monarchy line, so it is a likely source for the two pictures Wallis exhibited of the staunch Republican and regicide Henry Marten in 1856 and 1858, since it contains a life of Marten who would otherwise have seemed an obscure figure. Several other facts link Forster and Wallis in this period. Forster purchased Wallis' picture Shakespeare's House, Stratford-upon-Avon exhibited at the RA in 1854. He was also chairman of the London committee of the Royal Shakespearian Club and this may help to explain Wallis's concentration on Shakespearian subjects in these years. Finally the Bodleian archive of Wallis's contains two letters from Forster dated 1856-58. Hickox, Michael, “The Political Background to the Death of Chatterton by Henry Wallis.” Victorian Web. 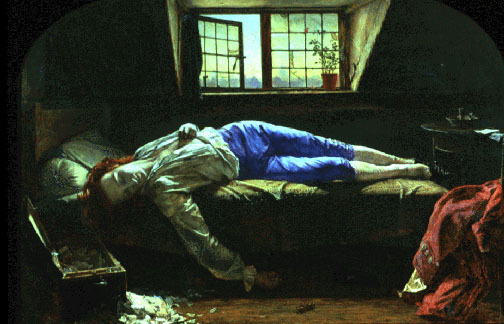 Hickox, Michael, “The Death of Chatterton by Henry Wallis — a Promethean picture,” Victorian Web. Pressly, William. The Artist as Original Genius: Shakespeare's 'fine frenzy' in late eighteenth century British Art. University of Delaware Press, 2007.